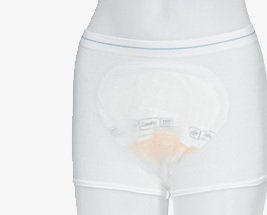 Stretch Pants are designed to hold Large Shaped Pads in Place ensuring maximum security. They are figure hugging and made of a comfortable stretch fabric. Stretch Pants are available in different styles including briefs and short leg pants. Briefs closely resemble normal underwear and short leg pants will fit slightly lower down the leg, this helps keep the pad securely in place.